Recognized as the first woman in America to support herself as a professional artist, Fanny Palmer was hired by the famed lithography firm of Currier and Ives. Her images of idyllic pastoral scenes, like The Old Homestead, provided comfort and solace to a nation riven by conflict. 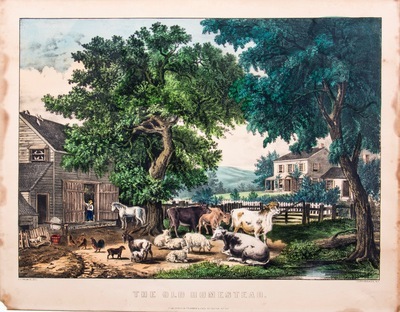 This peaceful farm scene offered its viewers an escape from the horrors of the Civil War.